As a college student, I lived in France for several months. While there, I did my share of solo touring and site seeing. Sometimes, I was pestered; sometimes I was left alone to take in the lovely scenery. 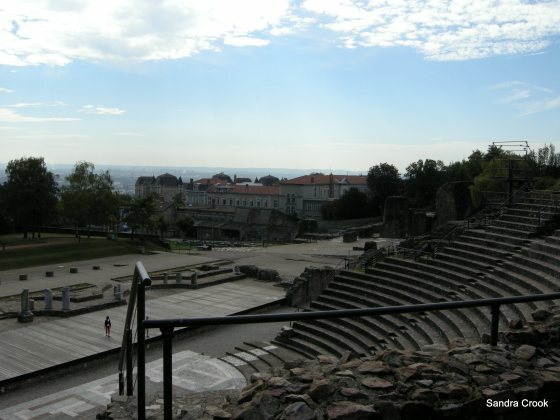 Some of these moments came to mind when I saw Sandra’s photo of the amphitheater in Lyon. I was reminded of some of the more colorful attempts to connect. This amphitheater dates from the second century, built by Romans. Imagine sitting here to watch a performance…. Allo? Pardonnez moi. Would you mind if I walked with you and talked with you? Would it bother you? Oh no…how am I going to shake this guy? I just want to look around in peace. Allo? Do you speak English? Ou peut-etre francais? This conversation really happened. When I said I spoke Chinese in English to his question, it confused him so much he stopped walking with me and talking with me. It worked. This entry was posted in Flash Friday Fiction. Bookmark the permalink. Ce pauvre bougre. C’est la vie. 🙂 That’s one way to get rid of them. Nice one. (When you get a moment Erin can you tell me how to access accents/symbols in WordPress). I did it the easy way – I went to a web page that had it written correctly and cut and pasted it. A work around,, but it was easier than trying to figure out another way. I shall have to try that trick…hmm, or perhaps tell it to my daughter. I don’t think he wanted to waste anymore time on someone as clearly confused as I appeared to be…. Thanks, Rochelle. I felt like it was a bit of a dodge because it was just a snippet of my experience, not true fiction. I almost got back up in the middle of the night and started over. Sleep won out, however, and your words this morning made me feel better. Perfect solution to a thorny problem. Loved your use of the French, especially the word, ‘quoi’. You background intro and notes at the end of your story dovetailed nicely. I think I neede more than 100 words for the story to make sense, so I made liberal use of the chance to set it up and close it out. Sometimes 100 words feels like a straight jacket, other times it is a beautiful corset that forces things into shape. Je ne peut parle francais parce que j’ai un carrotte dans ma oreil gauche. Try that one next time. This was funny, darling. One of my favorites was “va te faire cuire un oeuf.”. Basically, go cook an egg. So many colorful ways to say no thanks. I think not – he was probably on to the next target with no thoughts to the past. Thanks for reading! I know, right? It’s great to remember those days. They are good memories to have. Your title reminded me of what our family used to say–that someone had unmitigated gall. That would work here. Great brush-off technique. I tried to do a play on words – Gaul, gall. I know it’s a stretch, but I figured it was worth doing. I could understand it….you looked a lot different back then!